The third-generation Mazda MX-5 Miata returns without any major changes for 2008. Although the Miata's overall presentation has remained the same since its 2005 redesign, Mazda added numerous performance enhancements, including traction control, a multilink suspension, a six-speed automatic transmission, and stability control. Mazda will also offer a Special Edition Miata, which includes a premium features package and a special Icy Blue exterior finish. The new MX-5 has earned very positive reviews for its performance. 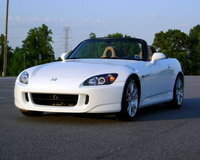 The roadster offers the ideal blend of responsive steering, sharp handling, and overall driving refinement. The Miata, now nearing its twenty-year aniversary, has built a strong reputation for combining roadster excitement with Japanese reliability. In addition to build quality, the Miata is also considerably more affordable than most European offerings in this segment. The Miata's acceleration is reasonable, but the 7.5-second 0-60-mph time is often cited as a driver complaint. The cramped interior is another common issue for owners. 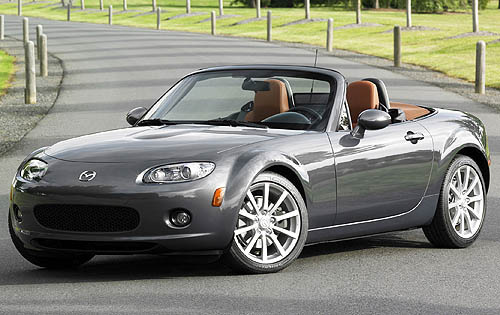 Mazda again offers four Miata variants for 2008. The base SV offers a basic standard features package, while the second-tier Sport adds a leather-wrapped steering wheel. The two upper trim levels, Touring and Grand Touring, add some upscale amenities: cruise control, keyless entry, and a CD changer on the Touring, and the Grand Touring adds leather upholstery, heated seats, and a Bose audio system. The Sport, Touring, and Grand Touring trims are all available with a powered retractable hardtop, which adds about 70 pounds of curb weight. 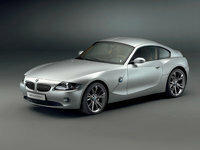 All four Miata trims house a 2.0-liter four-cylinder engine that delivers 166 horsepower and 140 pound-feet of torque. 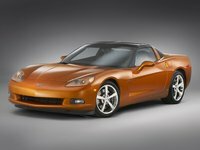 The SV and Sport models use a five-speed manual transmission, while the Touring and Grand Touring upgrade to a six-speed unit. A six-speed automatic with paddle shifters is optional on all trims except the SV, but opting for the automatic drops horsepower by 5. Fuel economy varies slightly with the transmission, but all Miata drivers can anticipate mixed-driving mileage averages in the mid-20s. What's your take on the 2008 Mazda MX-5 Miata? Have you driven a 2008 Mazda MX-5 Miata? How To Tell If My 2008 Mazda Mx5 Touring 2.0l Engine Is 158 Hp Or 166hp? Can the timing chain get out of adjustment? How can I check if the chain is aligned properly? How do you check the timing chain? Do you need to remove the valve covers?